One of the things that inspired me to want to become a boutique flower grower, was the lack of roses that really smell like roses in the market place today. 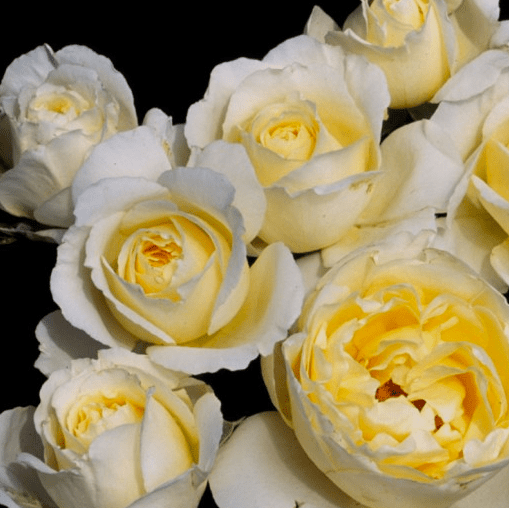 There are thousands of roses out there, yet, we only see such a limited variety in the market, and so many of those have been bred to the point that they no longer have a scent and they are near as bodacious and showy as garden roses. 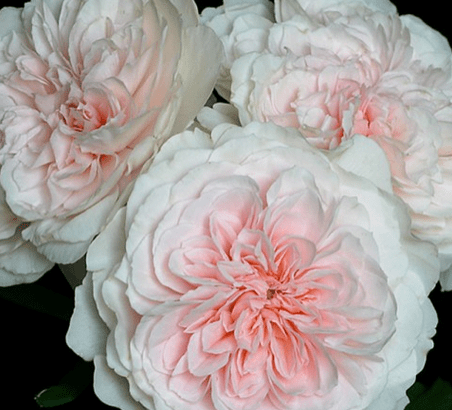 Enter in David Austin and other old-fashioned garden roses, … these are a game changer. Not only do they smell amazing, but they are stunning. Absolutely gorgeous. 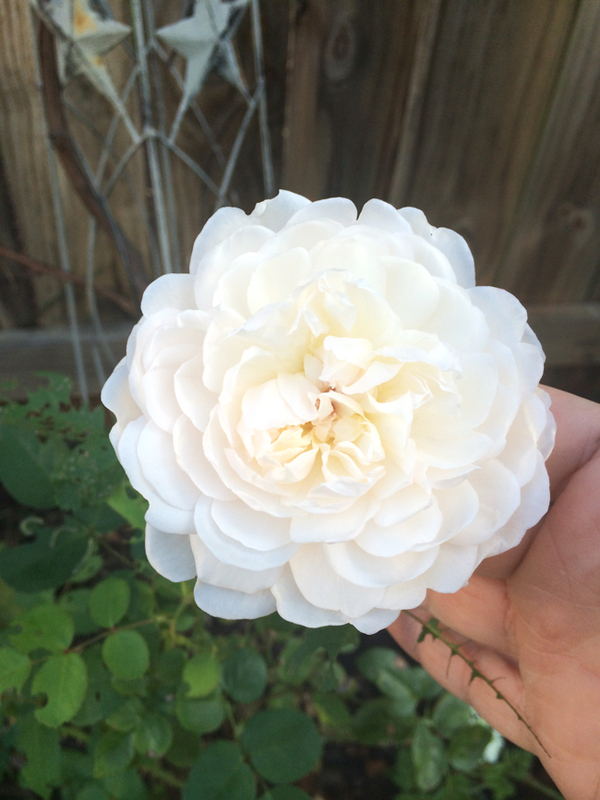 Last year early in the season, I came across the site Heirloom Roses and found some roses I wanted to try while searching for white garden roses from my “white garden.” My first two roses were Tranquility and Glamis Castle. 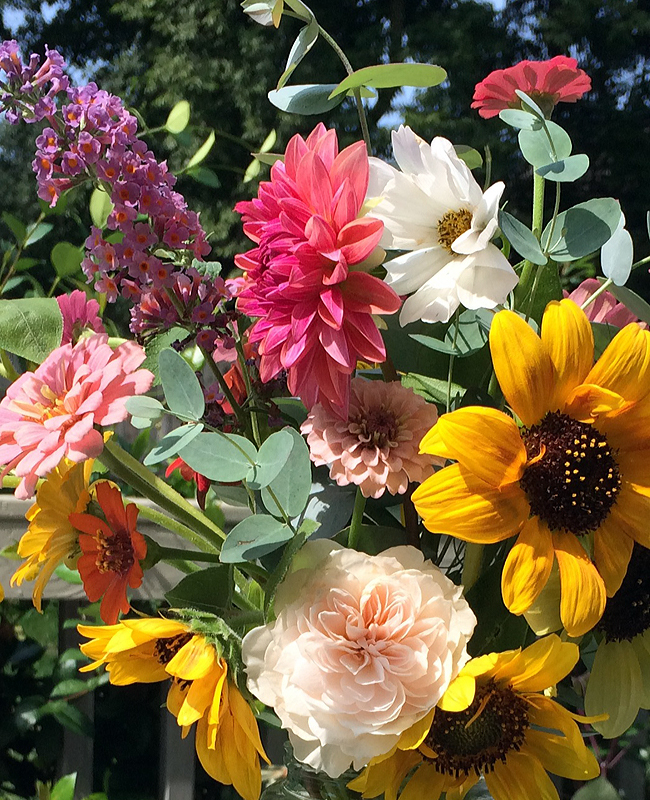 A summer bouquet from 2013 with Tranquility towards the bottom. Tranquility photo from Heirloom Roses. Glamis Castle in all its glory. This one has some tiny thorns, but the bloom is worth it. Once I fell in love with these two, I went ahead and ordered some more later in the summer. 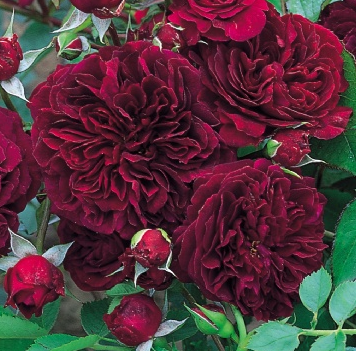 My late additions were David Austin’s Jude the Obscure and Irish Hope. This is some photos of Jude the Obscure. 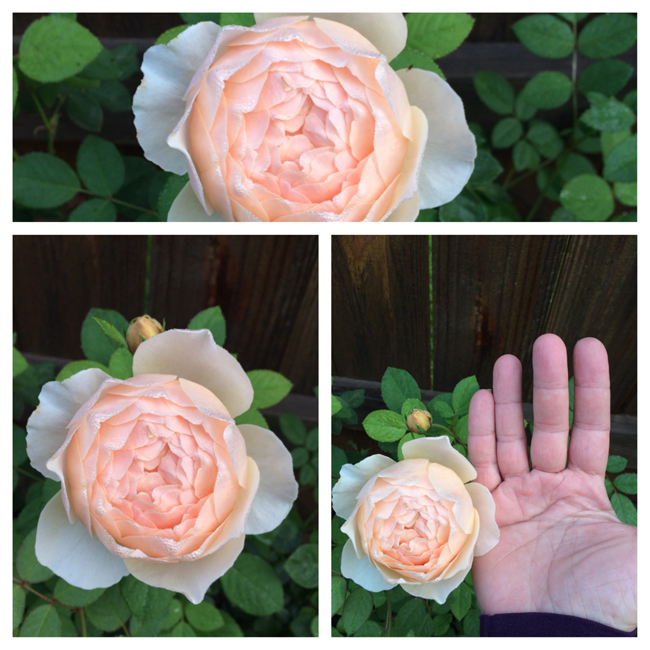 I wanted to show how large the blossom was using my hand as a reference. It smells amazing. The fourth one I picked up was Irish Hope. I don’t think I have a photo of it, so here is the photo from Heirloom Roses. Growing these roses last summer, as well as some other unique blossoms not easily found at the local supermarket or even farmer’s market, was what sparked the idea to perhaps consider growing them as a business. 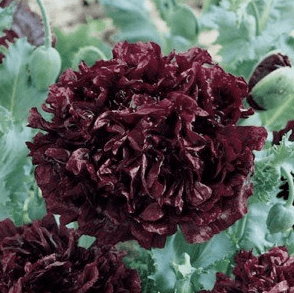 Since I follow a lot of florists, event planners, and flower farmers blogs and Instagrams, I started keeping a list of which flowers they posted about and were ravingt about. Getting an idea of what is popular with people in the industry was where I decided to focus on making purchases for this year. 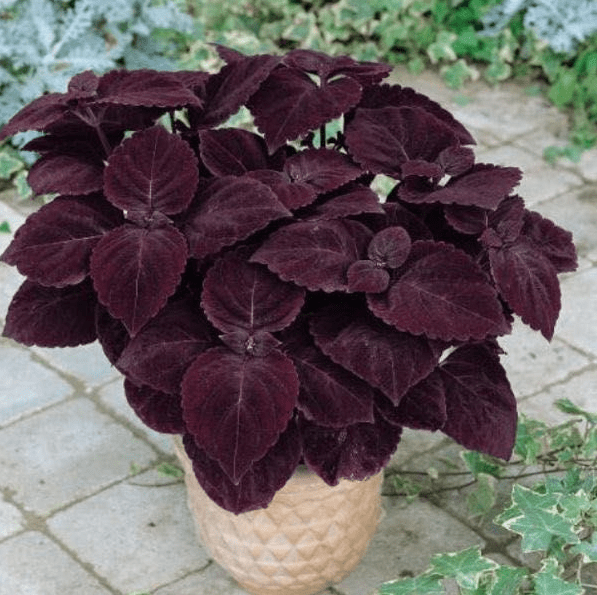 I also decided to focus on the recent naming of Marsala as the Pantone color of the year and purposely picked up a few varying flowers in that color scheme. 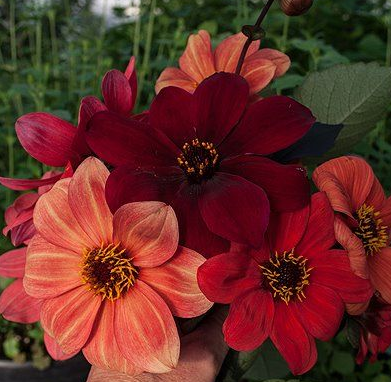 Tradescant Rose from David Austin, Bishop’s Children Dahlias from Select Seeds, and Giant Exhibition Palisandra coleus and Giant Double black peony poppy from Swallowtail Seeds. This year I decided to be more serious about this as a possible business and ordered a dozen new roses for our garden this 2015 season. In addition, I added 7 new peony plants, dozens of kinds of zinnias, as well as some berry bushes, honeysuckle, unique cosmos, 12+ cafe au lait dahlia tubers, anemones, various ranunculus, and various bouquet fillers. I am really excited to see where things go this season in the garden. I will definitely check in with photos as everything begins to bloom. Also follow me on Instagram at @blossomandbranch for photos.